This soup is one of my personal favorites. It is a hearty meal, with a fun texture and tons of colour. This super easy to make meal warms you up from the inside out and leaves your tummy feeling full and happy. I love Mexican inspired dishes because they involve some very important ingredients that we as vegetarians need, such as protein packed beans! Beans are low in fat and low in calories so you can enjoy as much as you’d like without the added guilt. Bring beans, tomatoes, water, corn, onion, garlic, bullion, and taco seasoning to a boil in a large saucepan. Once boiling, reduce heat and simmer for 20 minutes, or until the onion is tender. Once the flavours are blended, top with fresh cilantro or parsley. 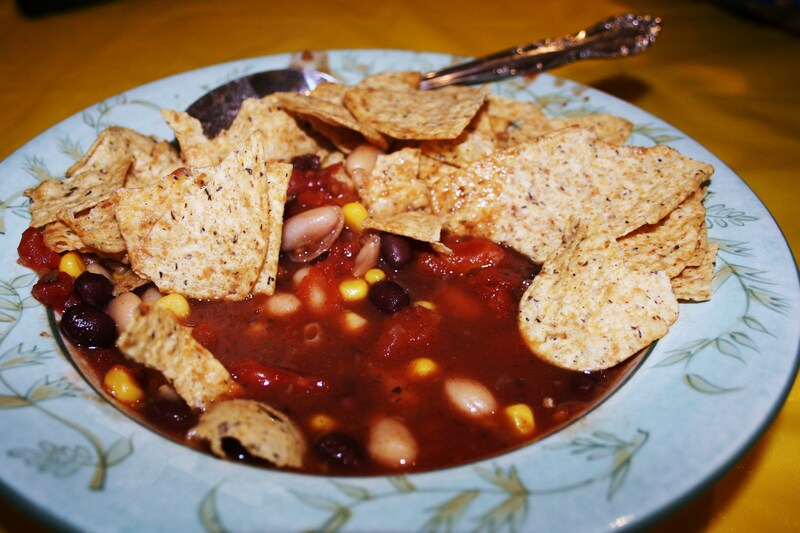 Ladle into bowls and top with crushed tortilla chips. *Add a dollop of vegan sour cream, if desired.